Coming to the Fourth Global Symposium on Health Systems Research? 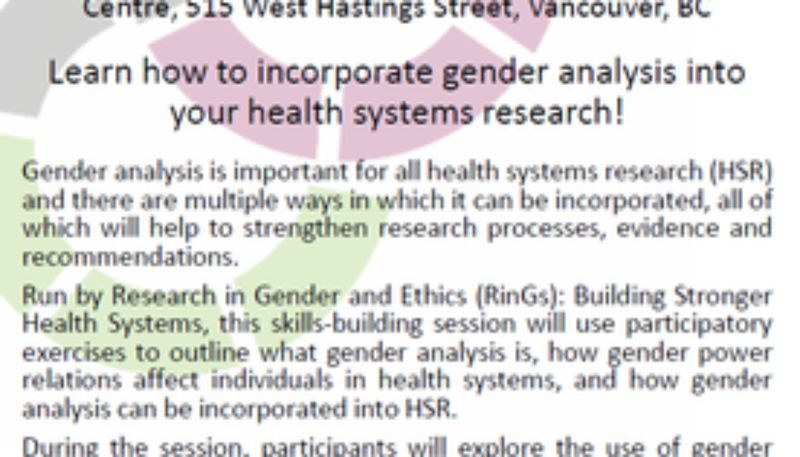 Join us at our skills-building session on how to do gender analysis in HSR! Attending the Fourth Global Symposium on Health Systems Research? Learn how to incorporate gender analysis into your health systems research! Gender analysis is important for all health systems research (HSR) and there are multiple ways in which it can be incorporated, all of which will help to strengthen research processes, evidence and recommendations. Run by Research in Gender and Ethics (RinGs): Building Stronger Health Systems, this skills-building session will use participatory exercises to outline what gender analysis is, how gender power relations affect individuals in health systems, and how gender analysis can be incorporated into HSR. During the session, participants will explore the use of gender frameworks and gender analysis questions to incorporate gender analysis into HSR, as well as consider the extent to which HSR outcomes can progressively transform gender power relations in health systems, or at least do not further exacerbate them. Interested in learning more about gender and HSR? Come and join us!